For our Best Places to Drive contest, we asked readers to share a photo of their favorite place to go for a spin. See the winner and finalists. 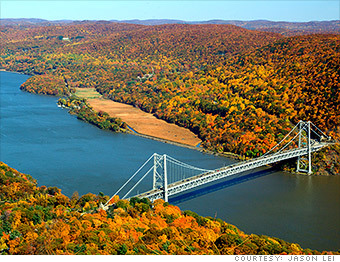 Dwellers of the urban jungle that is New York often forget that there are beautiful landscapes and breath-taking fall foliage to be found with only a 45 minute drive north of Manhattan. Without any hiking necessary, I was able to drive up to one of the peaks at Bear Mountain and take this snapshot without venturing more than a few footsteps from the car. The timing was perfect with the colors of the fall foliage in full bloom. Right after taking this picture, we went on to drive over the Bear Mountain Bridge that's in the picture that connects to the Grand Army of the Republic Highway.